A lot is written about colonialism. Its scars are engraved in the memories, histories, geographies, sciences, arts, politics, institutions and architecture of the colonized, and protrude into the conditions and standards of living of the people who endured it. Africans bore the worst brunt. With its panopticon mechanism, disjointed doses of knowledge to ensure subservience, couched with force and brutality to guarantee subjugation, the people were subdued and succumbed. Histories were silenced and muted for convenience, and dehistoricisation was employed to justify the ‘conquest’ and booty. 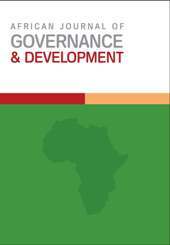 BETTY MUBANGIZI, SIMÃO NHAMBI, Introduction , African Journal Of Governance & Development: Vol 4 No 2 (2015): Close cooperation with citizenry while advancing close cooperation with international structures. OLIVER MTAPURI, BETTY MUBANGIZI, SIMÃO NHAMBI, Editorial , African Journal Of Governance & Development: Vol 7 No 2 (2018): The lizard that jumped from the high Iroko tree to the ground said he would praise himself if no one else did.